« What would YOU do with 3 wishes? 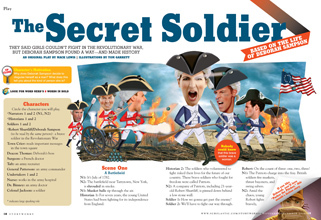 Mack’s new play based on the life of Revolutionary War soldier Deborah Sampson appears in the November/December 2012 issue of Scholastic’s Storyworks magazine. History recognizes Sampson as being the first female to serve the country as a soldier–though she had to disguise herself as a man and go by the name Robert Shurtliff to make it possible. “The Secret Soldier” is a true story, but Deborah’s life is far from being easy to map. Regardless of which account one believes, there’s no doubting Deborah served in the U.S. military, was wounded, and eventually received a military pension. To find out more about Deborah, visit archive.org or DistinguisedWomen.com. You can also get a sneak peak of the Storyworks play by clicking here. Follow instructions on the website to become a subscriber, which gets you access to a wide variety of accompanying comprehension activities and Smartboard lessons. This entry was posted on October 22, 2012, 1:38 am and is filed under American History, Read-Aloud Plays, Scholastic Products. You can follow any responses to this entry through RSS 2.0. Responses are currently closed, but you can trackback from your own site.